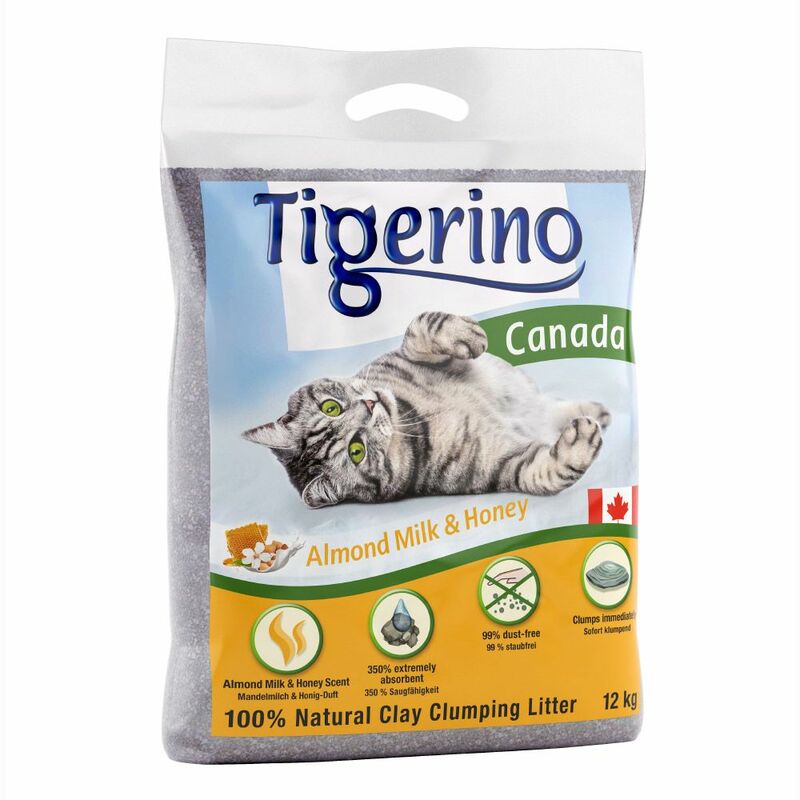 Tigerino Canada Cat Litter Limited Edition – Almond Milk Honey Scented is a natural clumping litter made in Canada from 100% natural clay. The litter is extremely absorbent and very economical. It rapidly and efficiently binds odours. This limited edition cat litter has a delicate almond milk and honey scent which makes it a pleasant experience for you and your cat. Tigerino Canada litter is up to 4 times more efficient that traditional clumping litter. It can absorb up to 350% and the granules are especially fine and low in dust (leΒ than 1% dust production). Tigerino Canada cat litter is made from 100% natural clay and is free from all chemical additives. Tigerino Canada Cat Litter Limited Edition – Almond Milk Honey Scented at a glance: Delicate, pleasant scent The fine natural clay grains make it very economical Very absorbent: 4 x more efficient than conventional litter Clumps immediately and very effectively (350% absorbency) 99 % dust-free very low in dust Rapidly binds odours, very effective and long-lasting 100% natural: made with pure, high quality clay - free from any kind of chemical additives The soiled litter forms rapidly into small clumps and the rest of the litter stays fresh and dry. Regular removal of clumps with a litter scoop will help to keep the litter hygienic and fresh. Find the ideal acceΒories for your cat's litter at zooplus: Litter Disposal Bins Covered Litter Boxes Litter Deodorant Products.